I played with my kid and accidentally heard recipe, which was offered in «Snidanok» on channel 1 + 1. This is essentially Knodels (as my grandma called them), but with the addition of certain partly even atypical or unusual ingredients for us. In the original recipe instead of cheese was parmesan, but I decided to replace the ingredient by more familiar to us. In principle you can use any cheese that you like. Color of dish depends on pumpkin. If you add nutmeg, it will be brighter than I pictured. 1. First, we need pumpkin puree. It is made as usual and favorite way for you (bake, cook, cook on steam). I baked with thyme. Pass through a sieve or blender. 2. Boil potatoes. Make a puree out of it. By the way, if you want to decorate the usual mashed potatoes, then cook it along with several garlic cloves (the amount depends on the amount of potatoes). Garlic is boiled well, gives flavor and transformes into puree well. 4. Add t it puree. It thickens. 5. Add egg. Stir constantly. 6. Add flour and cheese. Gnocchi should be figured. So make sausage, cut and press sides with fork. Boil in salted water, till the float + and a bit. 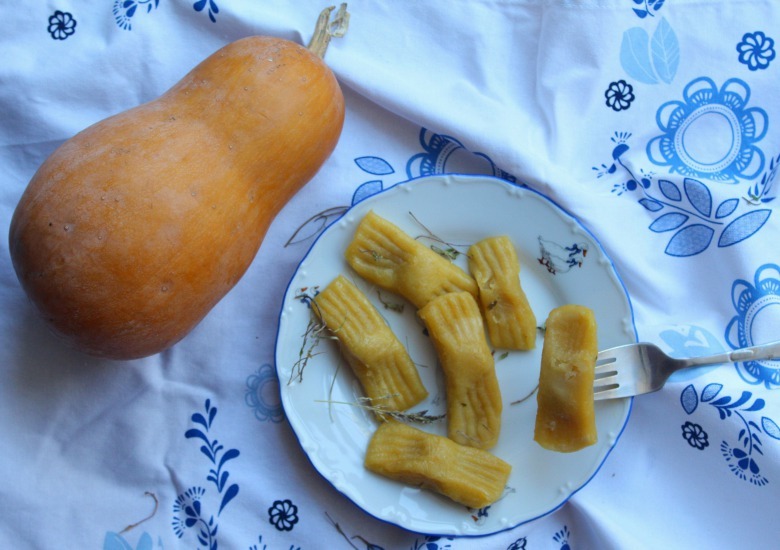 Top of recipe "Pumpkin gnocchi"